This week will mark the last session of two courses I’ve been teaching on the American Revolution for the past several months. I have to admit, I’m sad to see it conclude. I’ve taught a number of courses in several places on various subjects. This was my first time teaching specifically on the Revolution and I enjoyed it enormously. The thing that strikes me most about the Revolution is the profound fragility of it. There really is no earthly reason why we should have won that war. Outnumbered and facing one of the greatest professional armies on earth, the Continentals were, compared to their British foes, a malnourished, half-naked, poorly trained rabble. Washington’s role in this, in my opinion, cannot be over-emphasized. The man knew how to choose his battles…and for the most part, he chose battles that he knew he could win and that he knew would have maximum effect on American morale and foreign relations. As for the battles he could not win, he had an impressive ability to orchestrate retreats without exposing his army to complete annihilation or disintegration…both of which were very real possibilities in a number of instances. On the other side, the Revolution was miraculously aided by some staggeringly poor generalship on the part of the Britons. General Howe’s years of inaction guaranteed the success of the Revolution every bit as much as Washington’s action. Getting back to the stark contrast between the two armies, there is one painter who, as far as I’m concerned, has captured this better than any historian could with words. Howard Pyle is probably my favorite artist (close competitors would be Andrew Wyeth and Winslow Homer). Born in Wilmington, Delaware in 1853, by the 1890s, he was an accomplished illustrator with an acute interest in historical subjects. He painted and sketched beautiful illustrations for many magazines, particularly Harpers Weekly, and also for countless novels…mostly tales of adventure. Pirates. He painted a lot of pirates. I’m not so much interested in the pirate illustrations, although there is one called “Marooned” which I think is quite remarkable. Pyle taught illustration at Drexel University in Philadelphia and later organized his own school which would come to be known as the Brandywine School of artists, named for Pennsylvania’s Brandywine River where Pyle summered. Among the famous American artists Pyle influenced were Maxfield Parrish, N.C. Wyeth and, by extension, Andrew Wyeth (who probably comes in third on my list of favorites). At the top of this post is “The Battle of Bunker Hill,” painted in 1897 by Pyle and published in Scribner’s Magazine in 1898. 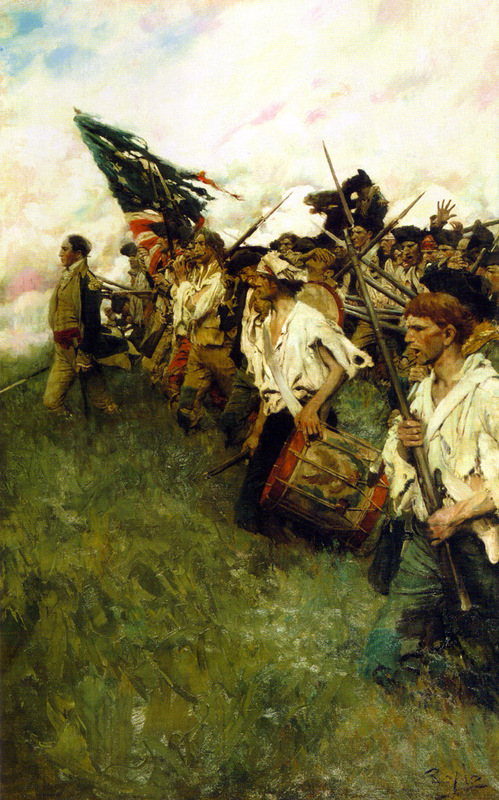 Depicting the 52nd Regiment of Foot advancing up Breed’s Hill, the original painting was in the collection of the Delaware Art Museum until it went missing in 2001 and is presumed stolen. Sad. It’s probably one of the greatest battle depictions ever painted. No other painting that I know of quite captures the “shock and awe,” if you’ll pardon the expression, of the British Army. During the Battle of Bunker Hill on June 17, 1775, the besieged British troops in Boston tried to break their way out by launching a frontal assault on the high ground of Charlestown across Boston harbor which had just, the previous night, been fortified by the provincials. Low on ammunition, disorganized and seriously wanting in terms of battle experience, the provincials nonetheless held a strong position and managed to repel successive assaults by the British Regulars before finally being forced to retreat. Imagine seeing the British come on like that! The discipline, orderliness and comparative enormity of the British Army are all perfectly captured in this painting. The British counted on these psychological advantages to help them win the war. By contrast, consider another painting by Pyle, “The Nation Makers” depicting the American infantry at the Battle of Brandywine on September 11, 1777. After about two years of not doing very much besides capturing New York, British General William Howe finally launched, in the summer of 1777, an assault on the American capital of Philadelphia. General Washington positioned his army halfway between Philadelphia and Howe’s landing place, taking up a position along the Brandywine River at a place called Chadd’s Ford. The Americans lost and Philadelphia was taken. But Washington’s determined defense of the city was a psychological victory which helped convince the French to join the war. 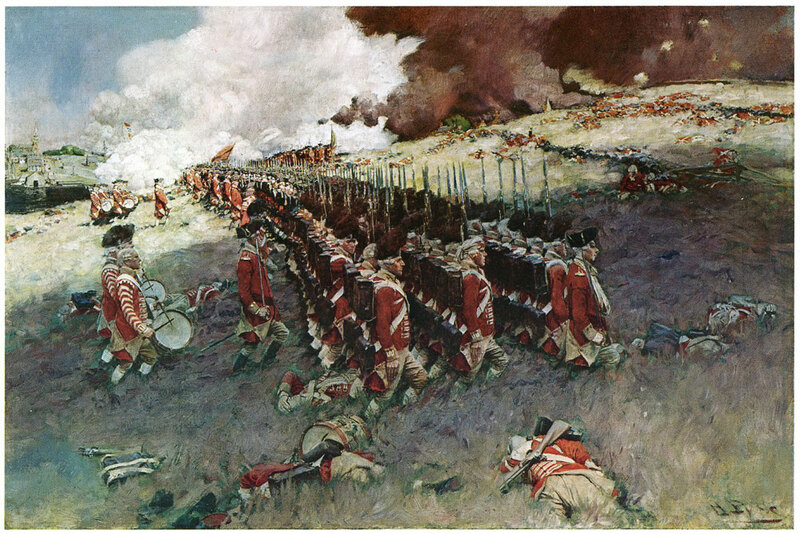 121 years later, Howard Pyle began teaching a select group of art students at Chadd’s Ford where the battle had taken place. During his years spent there, Pyle must have repeatedly pictured the American army resisting the British advance at Brandywine. In 1906, he put the image on canvas. The result is, I think, an exceptional representation of the ragged but determined American army. I don’t know if Pyle ever thought of the two works as companions. But together, I think they make a brilliant pairing, helping to bring to life the almost unbelievable notion that those perfect British ranks were beaten by those half-starved patriots.